VIFF 2016—Actor turned filmmaker Nate Parker writes, produces, directs, and stars in the historical biopic of real-life slave preacher Nat Turner leading the violent 1831 Virginian slave rebellion in the appropriately titled, The Birth of a Nation (taking back the title from the D.W. Griffith racist epic). The film is an undeniably powerful tale of Christian faith amongst slaves while reminding us the indignities and horrors of slavery. Parker has crafted an ambitious epic full of highs and lows that raises more questions, conversations, and uncomfortable truths still relevant today. Armie Hammer co-stars as Turner's master from youth who eventually capitalizes on his ability to read, preach, and spread his faith as a means to control other rebellious slaves and keep them in line. There are many characters, slaves and whites, but Parker struggles to balance them all, usually focusing on his own portrayal of Turner, as we slowly shift motivations towards the eventual slave rebellion and bursting violence. 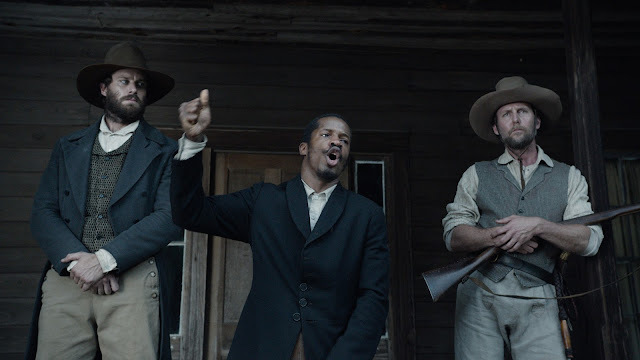 The Birth is a Nation is boldly Christian as Turner struggles with the power of his faith and its use as a tool to manipulate other slaves while condemning the actions of slave owners. There are strange visions and dream sequences that never quite fit with the uplifting scenes of preaching and horrific slave violence. This, along with Henry Jackman's often overbearing and pulsing musical score, distract from the raw power of the real-life story. Comparisons to the recent 12 Years A Slave are inevitable and unflattering. Parker is a much less experienced and polished filmmaker than Steve McQueen and was limited by time and budget. While his performance benefits from his clear passion, it also suffers sometimes sloppy direction full of close-ups, low angles, anti-climatic action, and mishandling of female supporting characters. There's no doubt the power and compelling nature of Turner's story. Parker, no matter how problematic a contemporary figure he has become, does a commendable job devoting years to making the film happen in such an efficient manner. However, it's clear his limitations as a filmmaker in balancing characters, historical drama, and his artistic motivations together in clunky fashion. However, The Birth is a Nation remains a powerful, messy, and fascinating exercise in exploring race, slavery, and violence in a historical context. The Birth of a Nation screened at the 2016 Vancouver International Film Festival as part of the Panorama series.